The job market made solid improvement last month, sending signals to markets that the Federal Reserve is on track to start pulling back on its stimulus program. The economy added 195,000 new jobs in June, beating economists' expectations of 155,000 jobs and matching the revised pace from May. Meanwhile, the unemployment rate remained unchanged at 7.6%. Spring hiring was also stronger than previously thought. The number of jobs created in April was revised up by 50,000 positions, while May was revised higher by 20,000 jobs. The report was being watched particularly closely by investors, in light of recent comments from Fed Chairman Ben Bernanke that caused wild swings in the markets. Prior to Friday, the S&P 500 was down nearly 3% since May 22, when clues first emerged that the Fed may slow purchases of bonds and mortgages as early as this year. Bernanke later said the stimulus program could end altogether if unemployment hits 7% -- which the Fed expects by the middle of next year. Despite no change in the unemployment rate, the underlying strength of the report led investors to believe that the bedrock of the economy is improving, and that the Fed will start to pull back sooner rather than later. Stocks rose slightly and bonds sold off following the news. For the last couple of weeks both stocks and bonds had been selling off, as investors fretted the Fed may be ending its stimulus program too early. "Investors are beginning to believe that the economy actually may be strong enough to grow without the extreme monetary support," said Bill Hampel, chief economist at the Credit Union National Association. "When will we finally get back to the day when good news for the economy is taken as good news by the stock market? It looks like we might finally be there." The report contained little in the way of bad news, with the size of the labor force growing and the participation rate rising slightly. The number of long-term unemployed people also fell. The biggest job gains were in leisure and hospitality (up 75,000), professional and business services (up 53,000), and retail (up 37,000). Construction and manufacturing were little changed. The federal government shed 5,000 positions, continuing a trend brought on by the budget cuts that have eliminated 65,000 jobs in the last 12 months. The number of people working part time because they couldn't find a full-time position rose by 322,000 from the month before. Some experts also pointed out that many of the newly-created jobs are in low-wage sectors. "Three quarters of these would qualify as low-quality jobs," said J.J. Kinahan, chief strategist at TD Ameritrade. Still, Kinahan noted that wages in June grew faster than the 12-month average, and was pleased with the report overall. "This proves what the Fed has been saying -- the economy is improving," he said. One of the few groups reeling may be those looking for a mortgage. Interest rates on home loans have surged over the last few weeks. 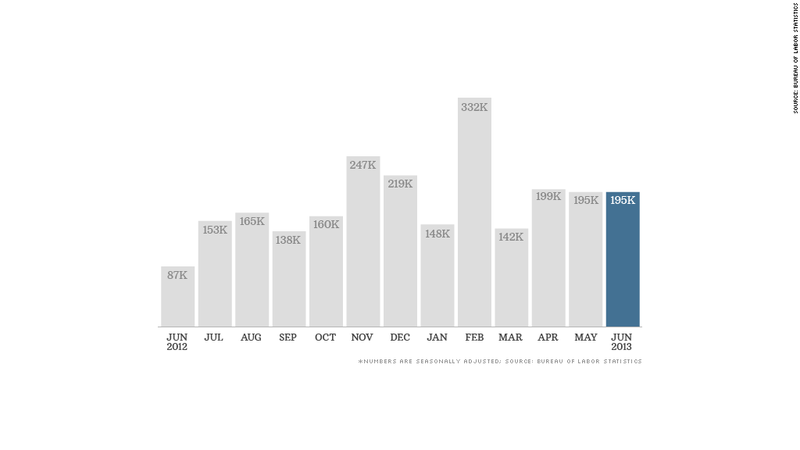 On average, the economy has created roughly 182,000 jobs a month over the last year. That's not bad, but it's not great either. Economists say that level of job growth barely keeps pace with the rising population, and is a far cry from the 250,000 jobs a month created during the boom times of the mid 1990s.